Continuing our explorations in 70s Swedish underground music scene ,here's a compilation came out through Silence label,gathering some of the most important folkish progressive acts of it's time. The whole project is blended by leftist feeling,pacificism,and all those "alternative" 70s ideologies.Musically it varys from folk to pilitic cabaret,some rockish tunes, protest ballads. Thanks man! I've owned this on vinyl for a long time! great to finally getting it on mp3! I had filed this the long forgotten never going to find this bin of my mind. 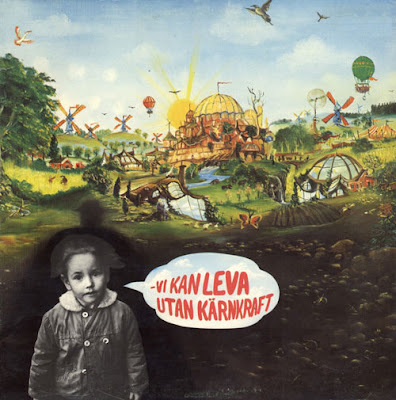 "Vi kan leva utan kärnkraft" = "We can live without nuclear power". thanks a lot!anything else from turid please? If you ever find Thomas Wiehe´s "I rummet intill" you´ll have a true swedish classic! One of the must surreal albums ever made. Not many people know about that, and I cant find it anywhere! Also Røde Mor´s greatest recorded work was the ep "Johnny gennem ild og vand" (Johnny through fire and water) about a Vietnam soldier coming home.